Evans-Goode, seated with defense attorney Thomas Saunders, looks at the floor Wednesday as the judge reads her sentence. POMEROY — A Meigs County woman was sentenced to 11 years in prison Wednesday after she was found guilty of multiple drug charges. 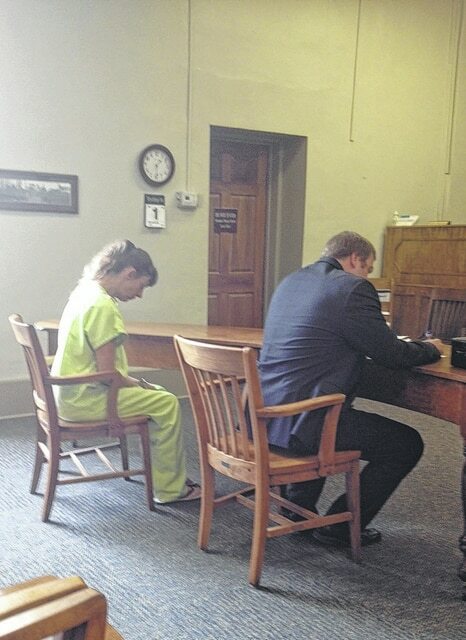 Susan Evans-Goode entered the Meigs County Common Pleas Court on Wednesday wearing handcuffs, shackles and a bright green prisoner’s uniform. In the custody of the Meigs County Sheriff’s Office since her arrest Jan. 21, Evans-Goode was found guilty Tuesday of illegal manufacturing of methamphetamine and illegal assembly of chemicals with the intent to manufacture methamphetamine. She returned to court Wednesday to accept her sentence. After hearing arguments from Meigs County Prosecutor Colleen Williams and defense attorney Thomas Saunders on sentencing recommendations, Judge I. Carson Crow asked Evans-Goode if she had anything to say. Judge Crown then handed down the sentence: Eight years on the first count of illegal manufacturing of methamphetamine and three years on the second count, illegal assembly of chemicals with the intent to manufacture methamphetamine. The sentences are to be served consecutively. In addition, Crow ordered a five-year driver’s license suspension, three years mandatory probation after release, and a lifetime firearms disability. As sheriff’s deputies escorted Evans-Goode out of the courtroom, she burst into tears and was immediately surrounded by family members, despite efforts of the officers to prevent the embraces. A woman who had earlier identified herself as the mother of the convicted woman said that she hoped prison would help her daughter recover as she shook her head and left the courtroom.